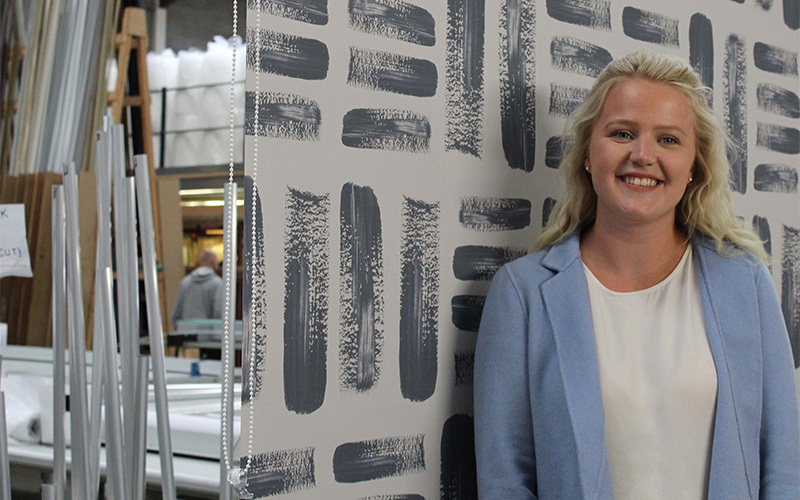 A brush-stroke pattern inspired by the Danish word Hygge – invoking cosiness and comfort in everyday things – by Year Three BA (Hons) Textile Design student Esther Lowles has won a design competition run by a UK blind manufacturer. Esther’s design beat competition from 40 students nationwide to win the £250 first prize from directblinds. Esther’s prize included a visit to the company’s factory in Huddersfield to see how her design will go into production. “The competition was set up as an opportunity for students to gain real world experience of creating successful commercial designs,” Esther said. “The brief was very open, meaning I had to research and come to my own conclusions about what would make my design successful and appropriate for the context. After the designs were entered they were then judged by industry professionals.